This page focus on my Art Practice. The body of work has deeper layer of meaning. 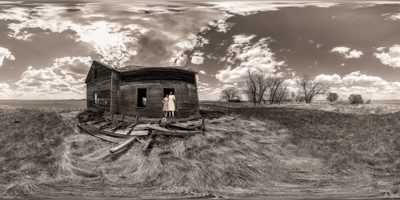 This project, I Might Be Gone: Abandoned , Alberta Place, and the 360 Photographics VR Image, began with the creation of a body of artwork that incorporates in its title the expression ‘gone.’ This expression is the faint souvenir of a home, field, or school with a minimum of human presence. This presence is a composite, layers that is extracted from a picture of an abandoned album (between 1890 to 1940) in which families have discarded. As such reality and time is distorted blending past and present state. This multimedia experience is my first journey into deeper meaning. Please click on the above image to take this journey.